There are two restaurants in Valpiana, both of which serve good food and deserve a mention as potential choices for eating out. They are located in the centre of the village within a few feet of each other. Valpiana is a convenient location for a place to eat if you are staying in or near either Massa Marittima, Scarlino or Follonica, all of which are only a short drive away. 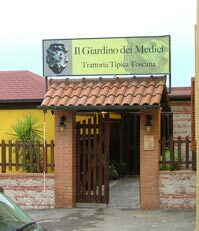 Once the local Osteria, the Trattoria Il Giardino dei Medici can be found in the Piazza delle Ferriere, next door to the post office. Be aware that Piazza delle Ferriere doesn't look like you would imagine a village square to look: it is the small area in front of the parish church. The Trattoria is, in any event, well sign posted, albeit if, as is often the case, the entrance itself is masked by parked cars whose owners are paying their bills in the post office or delievry vans for the adjacent DESPAR shop. The osteria has changed hands and I have yet to eat there, but the talk amongst the locals is that it is very good. The menu now includes fish as well as meat dishes, and pizza. They even do some dishes as take-aways. In the summer, it is advisable to book in advance. They don't usually operate second sittings for dinner. 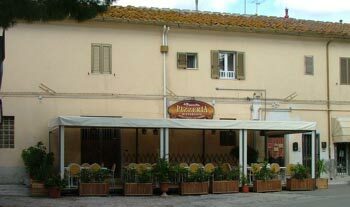 Literally just around the corner, is the Pizzeria Ristorante "La Piazzetta" with a menu that includes both fish (fried) and meat dishes. The pizzas are good but the pasta has been variable. In the summer, book in advance or risk not having a table until after 10:30pm or eating at all! Open in the evenings - early from around 5.30pm when you can also purchase a slice of pizza for your afternoon "merenda" (snack). Closed on Wednesdays. Open Sunday lunchtime for the restaurant menu, but not for pizzas (the pizza ovens are turned on in the evenings only). They do take-away pizzas, but be aware that if you are thinking of purchasing one during the summer it is best to get your order in before 7pm or earlier if you can (even for a later collection) or risk being turned-down, especially on a Saturday night.